There is some fun to be had in Pride and Prejudice and Zombies, surely, but not enough to overcome a confounding lack of actual zombies. Seriously. Where the hell were all of the zombies? Juxtaposing the classic novel of manners by Jane Austen against the backdrop of a zombie apocalypse is a simple enough premise that should offer simple rewards. The only brains in a movie like this should be getting eaten by zombies, so it would be nice if there were a few more of the undead around to eat actually them. Admittedly, I’m not familiar with Pride and Prejudice, except for the classic tidbits that have worked their way into the popular conscience. A film adaptation of a novel by Seth Grahame-Smith that riffs on the Austen classic, Pride and Prejudice and Zombies tells the story of Mr. and Mrs. Bennet’s five unmarried daughters living deep within the walls of London, the last human city remaining after a zombie outbreak devastates 19th century England. Just as the wall surrounding London begins to crumble, master martial artist Elizabeth Bennent (Lily James) finds herself torn between the competing affections of prejudice, highborn Mr. Darcy (Sam Riley), and a humble, seemingly honorable soldier named Mr. Wickam (Jack Huston). Refusing to set down her swords, Elizabeth is reluctant to entertain such a love triangle…until it could mean the difference between defeating the zombie hoards and the total annihilation of humanity. What is really tragic about Pride and Prejudice and Zombies is that it starts off quite good, but can’t find its rhythm after the first act. I had so much fun with the early scenes of zombies interrupting afternoon tea and ballroom dances. The introduction of zombies into iconic costume drama settings is never very clever but, then again, it isn’t supposed to be. The jarring juxtaposition initially pays off with a few big laughs and even some original zombie mayhem. However, the middle section of the film ignores the zombies almost entirely, until they return for a by-the-numbers finale that doesn’t have any steam. The scene-stealer of a film like Pride and Prejudice and Zombies should be the, you knows, zombies…but former-“Doctor Who star Matt Smith takes that honor here. It’s the trademark of a great actor that they can breathe life into flat scenes, and Smith appears to be having more fun than anybody else. Perhaps the PG-13 rating limited director Burr Steer from fleshing out his flesh-eaters. After all, the whole fun of zombies is that they are vehicles for gore that you normally can’t see in PG-13 movies. 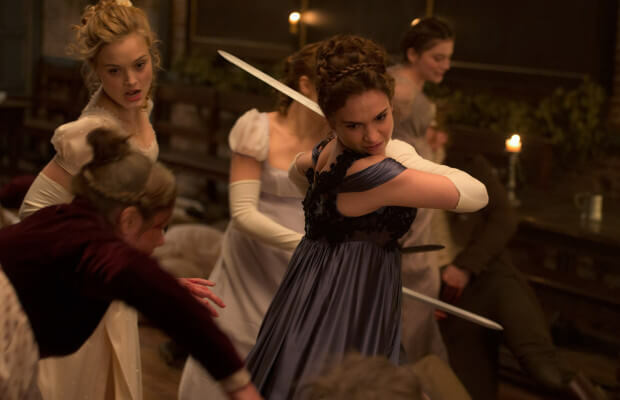 My good opinion once lost is not lost forever and, once again, I’m not terribly invested in the Austen story or the Grahame-Smith update, but I wouldn’t mind seeing another go at Pride and Prejudice and Zombies in a few years. Especially one with a rating that allows its zombies a bit more screen-time. Although I admire some of the schlocky thrills, the weak resolve of the film’s zombie mayhem is nothing to pride itself on.